Interior Redesign Slideshow Presentation Helps You Get Prospects to Use Your Redesign Services! You're gleaming as you set multiple appointments for consultations and redesign services. You've even picked up a couple of referrals in the process. Can it really be as easy as all that? Start Now Before Your Neighbor or Best Friend! The time is right! The opportunity has never been better! But those that get in on the lucrative redesign, furniture arranging, furniture arrangement, home staging, house fluffing, home enhancement business early are the ones that will reap the largest rewards. Our introductory price for the 60-Slideshow Presentation plus Exclusive Custom Written Script should be $79.95. But if you order right now, during the introductory phase, it will only be $49.95. If you landed just one client this would be small change, a small price to pay to have people begging you to do their home. And you can use the slideshow any time you want, as often as you want, in front of one person or many. To order your copy, go to our secure server shopping cart and select the "Tools of the Trade" category. You'll find it listed there. Purchasing is easy: Secure Shopping Cart/Tools of the Trade. Scroll down until you see the Interior Redesign Slideshow with Script. The Interior Decorating Method Anyone Can Do - The No Fail System! You've struggled with your living room for the past 5 years. It's embarrassing. You've moved the furniture around. You've bought a couple new pieces thinking that would fix the problem. It didn't. You're tearing your hair out. You want to just cover everything and make it disappear. You know there has to be an answer but you can't figure it out. Your husband is a judge and his fellow judicial friends come over every Wednesday to jam in their band. You always feel like pulling a disappearing act whenever they come, but you've got to be hospitable. You just got through reading about a decorating method that you're sure will finally help you solve the problem. You read it from "cover to cover" on your computer. It was easy reading and makes a whole lot of sense. . .
. . . Skip to 8:00 PM. Hubby is due home any minute. You're excited. You can't wait for him to see your "new" living room. You can't believe how easy it was to learn what to do and how little time it actually took to work out the perfect arrangement of furniture and accessories. You hear his car in the driveway . . .
You've got a lot of stuff. It's everywhere with no rhyme or reason. Or you've just entered a client's home that is poorly arranged. You want to know instantly what's wrong with the room and how to fix it right the first time. You'd love it of someone could teach you how to dissect a room - any room - and teach you everything you need to know about how to arrange it correctly, no matter what's in the room. BRAND NEW AUGUST 2005 BOOK! 189 pages of illustrated drawings and photos of professionally arranged rooms, together with my personal notes. An incredible and exclusive manual of redesign training available no where, no, not at any price! 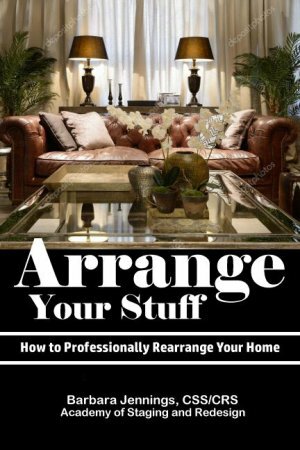 The most comprehensive, easy-to-understand guide on the subject of furniture arranging. Designed to complement and supplement Decor Secrets Revealed. TESTIMONIAL - "Today I rearranged my Family room. Looks the best ever, I have a corner fireplace, I used one of the ideas, it is soooo put together! I rearranged my pictures, mirrors etc. My husband thought he was in the wrong place when he came home from work. LOL I love this! - Shirley Singer"
RECOMMENDED BY HGTV, CLEVELAND MAGAZINE, LA TIMES, ORLANDO SENTINEL, MIAMI HERALD AND MORE! Use the Furnishings You Already Have to Redecorate Instantly! Get Affordable Interior Design Consultation in Your Home from Barbara Jennings Herself! Get Affordable Personal Consultation in Your Home from Barbara Jennings Herself! Copyright 2003-2005 Decorate-Redecorate.Com All rights reserved. Imagine attending a sophisticated party full of interesting people you've never met before. Imagine being asked what you do for a living. See the look of admiration on their faces as you hand out your professionally design business card. Imagine the flood of compliments as your hostess tells them you did all the decorating.